Richard Serra’s Wake is an exception to my general desire to trade large geometric sculptures for trees or at least hunky Greek sculptures. The 5 pods that collectively make up the 125 ft long 300 ton piece stand over 14 feet high, are 48 ft long, 6 ft wide, weigh 60 tons each and are impressive. And while nothing can compare to my love of nature, these undulating rust covered mammoths are at least as good as marbled man meat. Wake’s patinated pillars are meant to mimic the rippling waters of the nearby Puget Sound, though due to their size they may just as well represent the ship hulls that cause such water displacement. The fact that Serra was largely influenced by his father’s work at a shipyard, and knowing that this piece was created by machines which manufactured ships and nuclear submarines suggests both readings are correct. Take your pick or just imitate the art and sway between the two because honestly, it doesn’t matter what it means, as Serra said "What's important is you moving between them, through them, and around them as they undulate; it's your body moving in relation to their surface that moves." The huge work was bought from the Gagosian Gallery for a pretty huge price tag of $5 million in 2004. This sounds like a lot to me, but the folks who fronted the money are good for it; Jeffrey Brotman was one of the co-founders of Costco, Bagley Wright was a chief developer of the Space Needle, and Ann Wyckoff is a self-described homemaker who gave a cool million to Obama’s 2012 campaign. When I was standing in the middle of these giant and gently rusted shapes I felt like I was in the presence of ghost ships. It was an odd feeling. They dwarf the viewer. The 'hulls' are at least fourteen feet high and weigh sixty tons each. But they don't overwhelm, they undulate in a friendly, playful sort of way. You can tell that Serra spent his childhood hanging out in the shipyards in San Francisco where his father worked. He watched large tankers being launched into the chilly waters of the bay. These giant structures, sitting on a bed of gravel, look like they are ready to be launched. And Puget Sound is just over the hill, waiting. 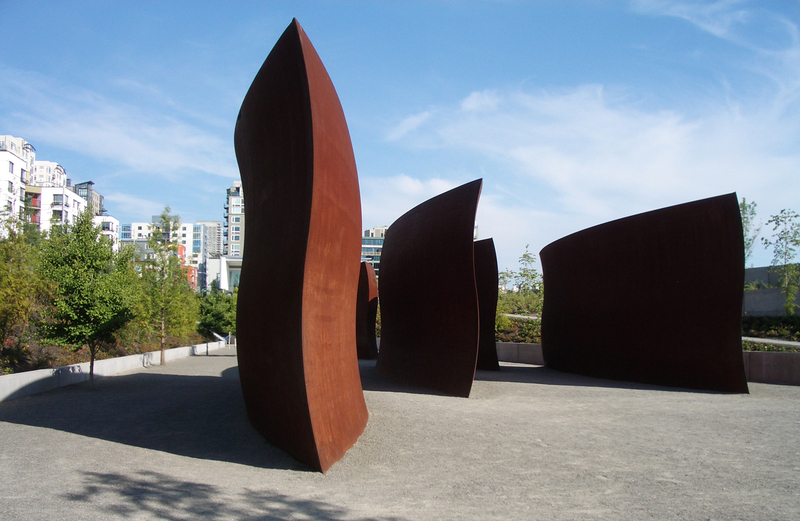 Wake is a 2004 weathering steel sculpture by Richard Serra, installed at Olympic Sculpture Park in Seattle, Washington.Arts Observer called the installation "a must-see", offering "incredibly diverse perspectives from various angles and vantage points". It was the first piece installed in the park, in July 2006. Check out the full Wikipedia article about Wake (sculpture).